With average earnings of $100,000 and up and no college degree required, a professional actuary is probably one of the highest-paying jobs — and yet one you may not have heard of. While some have heard of the term “actuary”, very few know what these people do. Strength in Numbers: An In-Depth Look at Actuarial Science for Math Enthusiasts clears the confusion about the actuarial field and gives aspiring college students tips for breaking into this difficult (but profitable) profession. What is Strength in Numbers About? Although actuaries don’t need a college degree to work, getting into the field is not expected as author Chloe Hung will tell you. Becoming an actuary is a challenging process with challenging examinations that require knowledge of statistics, probability, computer programs (Excel, SAS, etc. ), and project management skills. These requirements are the reason most prospective actuaries go to college before attempting the exams. A college degree doesn’t guarantee an actuarial student will easily pass the exams as author Chloe Hung found out. Hung experienced plenty of stops during her journey to becoming an actuary. Once a future actuary passes the initial exams, they earn “Associate” status until they pass another round of exams. At that point, they can legitimately claim the professional actuary title. For some, going through these grueling actuarial exams and a certification process isn’t worth it. For others, this process is a small price to pay for a high-earning and growing career. Strength in Numbers guides and motivates current and future actuarial students through this challenging career. Hung is a formerly confused (but determined) actuarial student who persevered through the actuarial exams to become an actuary consultant, coach and mentor. Her book, Strength in Numbers represents her continued passion to improve awareness and job satisfaction in the actuarial industry. Her mission is to help other prospective actuarial students break into the actuarial field with confidence. What Was Best About Strength in Numbers? Strength in Numbers is an inspiring career guide for aspiring actuaries written from the perspective of a former college student who has survived the process. Because of Hung’s background, she is able to tailor her advice to her target student, the hopeful (but nervous) college student who wants to determine if an actuarial field is a realistic possibility for him or her. Although the subtitle of Strength in Numbers describes this book as comprehensive, it’s really more of an overview. The book outlines the key steps and struggles in becoming an actuary but lacks enough detail. For example, “Strength in Numbers” fails to share specific information about the content or format of the actuarial exams. Strength in Numbers also lacks a comprehensive description of the actuary field. While the book gives hints. more information is needed on the different industries and their day-to-day responsibilities. This would further help the book reach its goal of reaching future actuaries. Why Read Strength in Numbers? 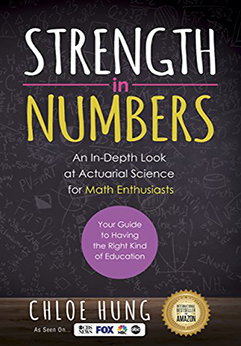 Strength in Numbers is the next book any aspiring student should consider after getting introduced to the actuarial field. The actuarial field doesn’t get a lot of press but offers many high-paying careers. Hung does students a huge service by profiling this career and demonstrating it is possible to break into it with the proper training. Hung doesn’t sugarcoat the entry process. She simultaneously shares the obstacles of the field and also how to go about overcoming them. That possibility is what carried Hung through her actuarial journey and what inspired her to write Strength in Numbers.